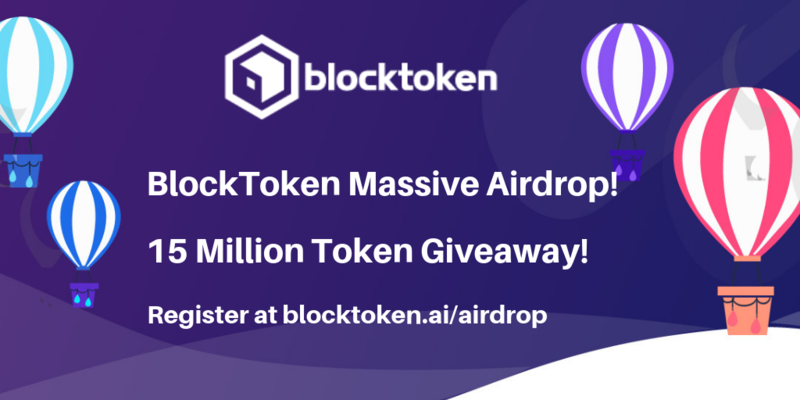 BlockToken is doing an airdrop to build a community and distribute the tokens to a wide network. The airdrop allocation is 15 million BLT Tokens (total value $3.75m based on full token price of $0.25) to registered participants. Register and invite friends to our airdrop to receive BLT Tokens – earn more by placing high on the Leaderboard at the end of the Airdrop. Also, we will have 100 random winners (irrespective of your leaderboard rank) of 10,000 tokens each announced at the end of the airdrop. Registrations for the Airdrop will close 20th October 2018, we will announce the token distribution date closer to the end of the Airdrop campaign. Rank 51 to 100 – a further bonus 10,000 each. The Leaderboard prize is in addition to any tokens you generate from referring users. We will award the 100 random participants throughout the airdrop with an additional 10,000 tokens each. Selection will be at random and is irrespective of your position or current stakes tally. Get over 20 registered referrals and earn a further 2,000 bonus tokens. Fill in the registration form at https://contest.blocktoken.ai and follow the instructions on the page. The airdrop is limited to 15 million tokens and will close once the maximum allocation is received or the close date is reached for the AirDrop. Joining our community will keep you updated with all events and progress of BlockToken for the Token Sale and Airdrop. On registration you will receive a referral URL – use this to invite friends to the AirDrop and be rewarded when they sign up. Token distribution date is yet to be finalised. If the Token Sale timetable is postponed for any reason, we reserve the right to postpone airdrop distribution. BLT Tokens are EOS native (mainnet) tokens. You will need an EOS compatible wallet to receive the BLT Tokens. You can set this up now or just before we announce the distribution date. We have a guide at https://blocktoken.ai/setup-scatter-eos-wallet to help you get started. You will need an EOS Mainnet address to receive the BLT Airdrop Tokens. BlockToken or any sites where this AirDrop program is not responsible for any wallet choice you make. Please do your own research about wallets. The wallets suggested are merely examples of compatible wallets. Do not use an exchange wallet. You will need to verify your email address and referrals if we suspect a user of using fake accounts, dummy email addresses or spamming we reserve the right to ban you and any referrals from the AirDrop program. We will ask you to complete a KYC form prior to distribution of the tokens. We will undertake a verification process during and at the end of the Airdrop to ensure that all registrations are genuine. Leaderboard results will be adjusted for any removed or banned users. Do I need to have EOS in my wallet? You don’t need to have EOS in your wallet for this current BlockToken AirDrop. Leaderboard winners will have their tokens escrowed for between 3 and 6 months. Do I need to stay registered with BlockToken? Yes, if you unsubscribe before airdrop distribution you will not be qualified for the BlockToken airdrop. Do I need to stay in Telegram group of BlockToken? Yes, to be eligible for airdrop you need to be a member of the community. Rewards are per registered and confirmed referral, there is no cap except the closing date and total allotment of tokens for all signed up participants. After completion of the form, each registrant gets a unique referral link. The dashboard can be found here: https://contest.blocktoken.ai. What if the 15 million cap is not reached? We are aiming for at least 10,000 participants in the airdrop, if the cap is not reached, we may elect to run a second airdrop round. The leaderboard is calculated on total value of points for registering and referring other users to the AirDrop campaign. To be awarded points anyone you refer must also register for the AirDrop and remain registered for the full program. To win any of the top 5 prizes you must generate at least 500 referrals. If this is not reached we’ll distribute prize allocations to all on the leaderboard based on their proportional stakes. Email addresses must be valid and each user must provide an EOS address to receive the tokens (fake registrations will reduce your overall standing on the leaderboard and will result in disqualification).